When’s the last time you had a no spend weekend? 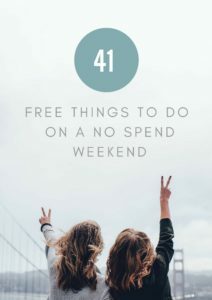 If you’re unfamiliar with the term, a no spend weekend is exactly what it sounds like – you don’t spend any money for the entire weekend. You may be surprised how much money you can save this way. Whether it’s activities for the kids, dinners at a restaurant, movies, getting drinks or shopping sprees, those weekend expenses can accumulate quickly. Watching a movie at home is often more fun than going to the theater anyway. Break out one of your favorites that you haven’t watched for a while. Not only are you getting a workout, but you’re also spending time out in nature. Hiking is a great way to relax, especially after a long week at work. Whether you walk around the trails or hit the swings to feel like a kid again, there’s always plenty to do at the park. Curling up on the couch with a good book is fun and great stimulation for your mind. Set up a poker game with chips instead of real money, or play a board game for a free group activity. You’d be amazed how much better you feel when your home is clean and organized. If you find anything you don’t need, you can also sell it or donate it. Unwind with the latest RPG, or choose a classic video game and see if you still know all the tricks. Journaling, like reading, is another one of those activities that stimulates the mind. It’s also helpful to get your thoughts and feelings down on paper. What’s something that you always wished you could do? Look up tutorials and learn it. Hit the local basketball courts and shoot around, or throw a football around with your kids. There are plenty of free art galleries out there. Find one and learn more about art. Always wanted to be better at saving money? Figure out how you can start saving every month. If you find yourself making the same meals often, get a new recipe and try it out. Sometimes it’s nice to just kick back and spend your day watching one or two seasons of a good TV show. No matter what language you want to learn, you can find plenty of free resources and apps to get started. Get some extra sleep in the middle of the day and see how refreshed you feel after. Giving back to others is always a rewarding experience. Figure out your long-term goals, and then break them down into smaller, manageable items that you can accomplish on the way. Make some sandwiches and find a comfortable place to eat outside. Choose a friend or family member that you haven’t spoken to lately and give them a call. Go out on a clear night and check out the constellations. Draw a bath, pour some bubbles in it and let it wash away any stress that you have. If you like the idea of your thoughts being online, start writing a blog and it could turn into a money-making endeavor if you stick with it. You can most likely find free yoga classes in your area, or you can bust out the yoga mat and practice poses at home. Pick out a neighborhood that you haven’t seen before and go take a walk around. Put on your helmet and take a ride through the city or a more rural area. Plant something new or just tend to the plants that you already have. It’s highly rewarding and therapeutic. Choose a podcast on a subject that interests you and give it a listen. You will likely learn something new! Make yourself or a deserving someone some cookies, cupcakes or anything else that sounds yummy. If you have the supplies, spend an evening sleeping in a tent under the stars. Pick out something you want to draw or just put pencil to paper and go with the flow. Invite some friends over, hook up your speakers and have a dance party. Turn off your phones and spend an evening with that special someone. Make some money on your no spend weekend by selling those old items that you never use anymore. Make your favorite coffee, or froth some milk and have a nice latte. Go outside and see what kind of shots you can get, or hang out with friends and take a few selfies. Spend a day out on the lake and see if you can catch yourself dinner for next week. Get to know your neighbors and see what kind of fun events your community has to offer. Look on Pinterest for ideas and then change up your bedroom. Take out your guitar, harmonica or whatever instrument you have and see what you can do. Spend an afternoon or evening hanging out with your family. You don’t need to spend a dime to enjoy yourself. Try having a no spend weekend with a few of the items on this list.